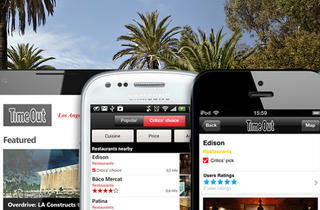 Our app was nominated for Best City App in 2013 LA Weekly's Web Awards. We're so excited to announce that our Time Out Los Angeles app was nominated for Best City App in LA Weekly's 2013 Web Awards. Not to brag too much, but if you don't already have our app on your iPhone or Android phone, you might want to download it now. It's free and it's a useful app to have when you're out in LA and looking for the next fun thing to do. Use it to find the best restaurants and bars near you—wherever you happen to be—and other great LA events happening in the city, from music and nightlife to film and arts. You can also bookmark your favorite places to eat, play and hang in LA so you're never stuck in a I-don't-know-what-to-do-today rut. So click here to download our free app and stay connected wherever you are in LA. If you like what you see, click here to vote for our app in LA Weekly's poll.